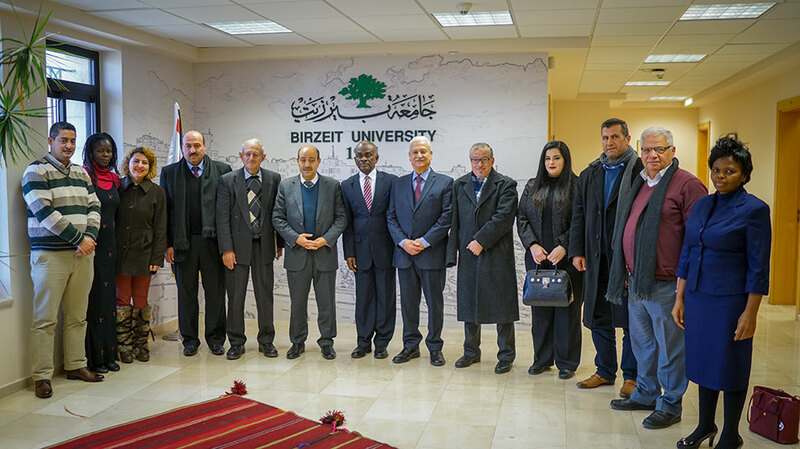 A team of representatives from the African Association of Public Administration and Management (AAPAM) explored channels of cooperation in public administration, research, and training with Birzeit University’s administration in a visit to the campus on January 16, 2019. The team, comprising George Scott, the AAPAM secretary general; Jessica Achieng Omundo, the programs officer; and Nancy Wangari Chiira, the administrative officer, met with President of Birzeit University Abdullatif Abuhijleh, Assistant to the President Aziz Shawabka, Vice President for Academic Affairs Henry Giacaman, and External Academic Relations Officer Amir Khalil. The AAPAM representatives also met Chair of the Department of Public Administration Nour Mattour, Director of the Master’s Program in Government and Local Governance Jehad Alayasa, and Professor of Public Administration Mohammed Abu Zayed. 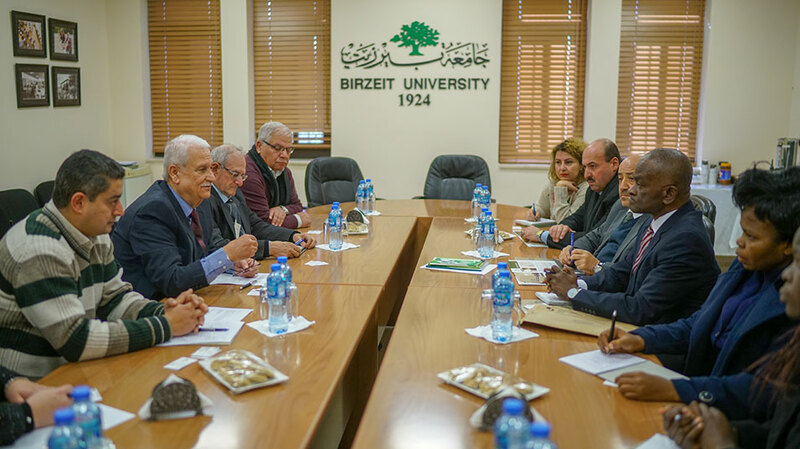 During the meeting, Abuhijleh introduced the delegation to the history of Birzeit University and highlighted the undergraduate and postgraduate programs that it offers. He also emphasized the community engagement efforts that the university carries out through the 11 centers and institutions that it hosts. Abuhijleh discussed the realities of education under the Israeli Occupation, which continually attempts to derail the educational progress at Birzeit University through campus closures and break-ins as well as the arrests of faculty and students. 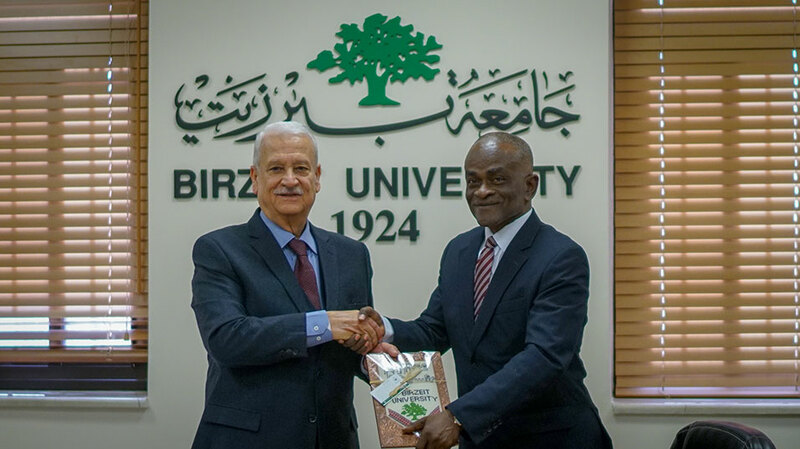 Despite the obstacles placed by the Israeli Occupation, Abuhijleh noted, Birzeit University continues to bolster its cooperation with regional and international partners, and remains committed to providing the highest level of education to its students and the broader Palestinian community. Recently, Birzeit University was ranked as the top Palestinian university for the fifth time in the 2019 QS World University Rankings, which placed the university in the top three percent of higher education institutions in the world, Abuhijleh remarked. Scott emphasized the importance of maintaining channels of communication between nations and institutions to successfully face national and international challenges, and said he is looking forward to increased cooperation with Birzeit University. “I believe that the world faces interconnected issues and similar challenges. Through unity and collaboration, we can make the world a better place,” he commented.